This summer an inspiring addition to the normal Auckland events calendar is coming! Germany’s Crazy Planet Records presents BASE FM Boat Parties, setting sail on Auckland harbour 8th and 22nd of February 2014 for two exclusive events with world-class International DJs, MCs, a fully stocked bar and quality underground sounds. 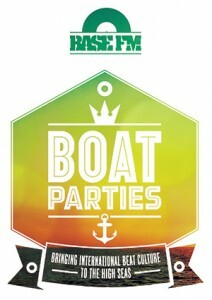 Hosted by Base FM, these boat parties are designed to inject some global flair into our high seas, giving ticket holders a taste of the Mediterranean summer down-under with a twist of kiwi flavour. Saturday 22nd of February, it’s Detroit’s hip hop ambassador, HOUSE SHOES, and world-class producer who’s worked with the likes J Dilla, Black Milk, Danny Brown & Elzi. House Shoes has toured with Exile, Aloe Black, Slum Village and Mayor Hawthorne who is an integral part of the burgeoning Motown resurgence.